A view of Mont Saint-Michel from the land bridge in front. Mont Saint-Michel is a tiny island (well, some of the time; it's complicated) just off the Northern coast of France. 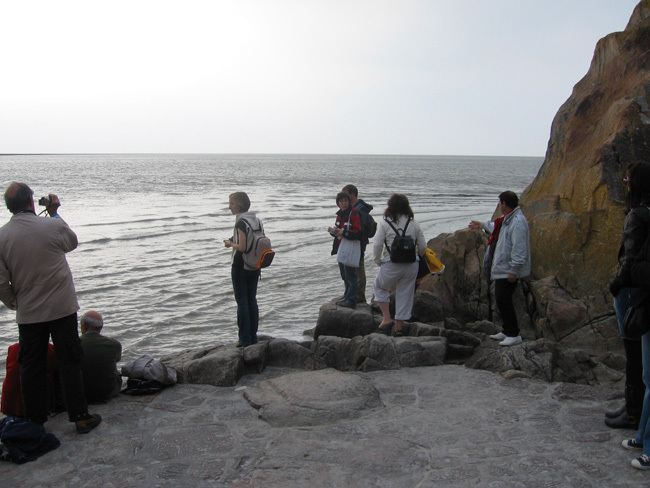 Historically, there was a low, natural land bridge that connected the island to mainland France during low tide, and this became completely covered by the sea during high tide, so visitors could only travel to and from the island at certain times of day. Nowadays there's a permanent, man-made land bridge with a paved road on it, so you can come and go as you please, which is very handy for tourists, as Mont Saint-Michel is one of the most popular destinations for travelers in France. As I first caught a glimpse of Mont Saint-Michel from the road a few kilometers away, with its gorgeous medieval abbey up top, I remembered learning about the place way back in my high school French textbook, and reading about the travelers who visited the island and its abbey as part of religious pilgrimages. The place really looks like something out of a dream or a fairy tale when you first lay eyes on it, and that doesn't stop as you get closer and closer. The beauty of the place is nearly intoxicating, and it makes a real impression as you finally arrive in front of the island and are dwarfed by the spectacular abbey towering overhead. 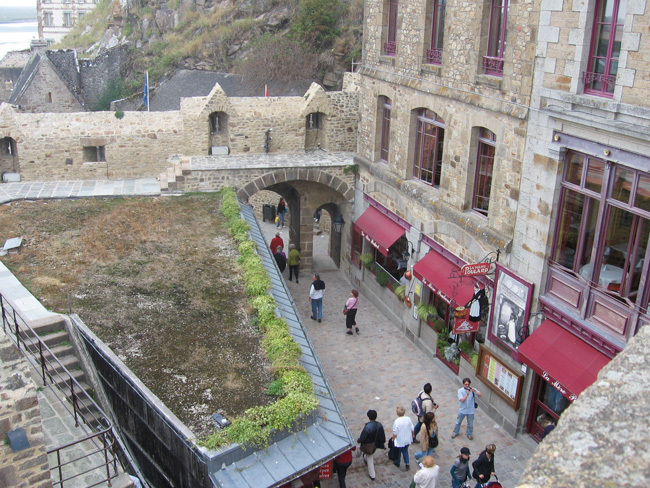 AS view inside the town from the ramparts above. 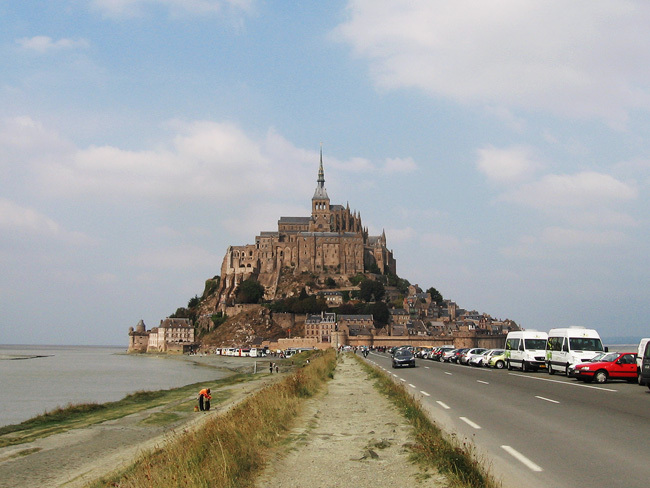 Driving to Mont Saint-Michel is probably your best option, although there are lots of tour buses that go there as well. It's a snap to park your car in the big lot just off to the side of the land bridge, but be aware that certain parts of the parking area will be under water later in the day! The parking attendant will ask you how long you plan on staying so that he or she can direct you to the appropriate lot, so this is one instance where if you don't speak French, you should definitely take the time to make sure you understand what's being explained. Just ask the attendant if they speak English if you don't speak French, and they'll certainly be able to accommodate you, as this is a place that draws a tremendous number of foreign visitors every year; you'll quite possibly hear more English, German, and Japanese than French as you roam the crowded, winding streets of Mont Saint-Michel. Speaking of the visitors, the tiny town surrounding the abbey is one of the most overrun-with-tourists places I've seen in all my travels! This can be frustrating at times, but it's just part of the experience of visiting a place that's so famous and fascinating. Take your time and go with the crowd rather than try to fight the tide, and you'll soon slip into a comfortable, leisurely rhythm and forget how jam-packed the place is. You may find, as I did, that the overwhelming commercial-ness of the main streets of the town is a little bit depressing, but fortunately this fades away as you escape up into the ramparts or toward the far side of the island. The capitalistic assault you sustain as you enter the town is temporary, I promise! Divert your eyes from the tacky souvenir shops and take a moment to enjoy the ancient paving stones, the crumbling walls, and spindly iron gates. And don't miss the pair of enormous iron cannons near the front gates, which (I read on a sign nearby) were abandoned by the English army in 1434! The town and its surrounding ramparts are full of irresistible angles and textures, with steep stairways, tiny twisting alleyways, wooden-shingled roofs, ornate windows, a quaint cemetery, and the occasional arrow slit. I couldn't help but take a ton of photos throughout my visit. This is one of my few trips that's made me wish I had a better camera and actually knew how to take decent pictures. But you almost can't not take great pictures here. The main tourist attraction on the island is Mont Saint-Michel Abbey. I went inside to see about taking the tour, but as a budget traveler I decided the €8.50 ticket price (this was around 2010) was a bit higher than I was willing to go, and so I contented myself to just wander around outside and take in all the free sights all over the island. I noticed some signs with photos of the inside of the abbey, and it certainly looks beautiful, but not really different from historical and architectural sights you can enjoy for free in tons of abbeys, churches, and castles all over France. Everything on Mont saint-Michel is pretty expensive, so be prepared if you plan on enjoying a meal in any of the charming, traditional restaurants that line the main street around the island. Or better yet, pack a lunch and hunt down a bench or a wall with an incredible view of the surrounding mud flats, which you'll find virtually anywhere up in the ramparts and higher streets of the town. As for gifts, souvenir shops are always expensive, but fortunately there are always smaller items like postcards that are cheap just about anywhere you go, so you can take a moment to write home and then bring it directly to La Poste, right on the main street of the town. At the edge of the island, just before the tide comes in. From on top of the ramparts around the island, you can take in an excellent view of the surrounding area. During low tide, wide expanses of mud flats span as far as the eye can see. Staring across these mud flats, I remembered in high school learning the word for quicksand — les sables mouvants — because that was one of the hazards that religious pilgrims faced when crossing over from the mainland. Now there are warnings everywhere about the dangers of walking around on the mud flats (with a delightful icon of a lone hand poking up out of the sand! ), but lots of people do it anyway. I was wearing good shoes, so I opted to stay on dry land and just watch for sinking tourists. Something I was surprised to learn about Mont Saint-Michel is that, when the tide comes in and covers the land around the island, it's not just a slow, gradual rising of the water; it actually rushes in in a wave, with "the speed of a galloping horse," as I heard mentioned many times over the course of the day. So it could be disastrous to be caught out there in that, especially for pilgrims in previous centuries. Fortunately, there are now signs displaying the time that the tide comes in every day. 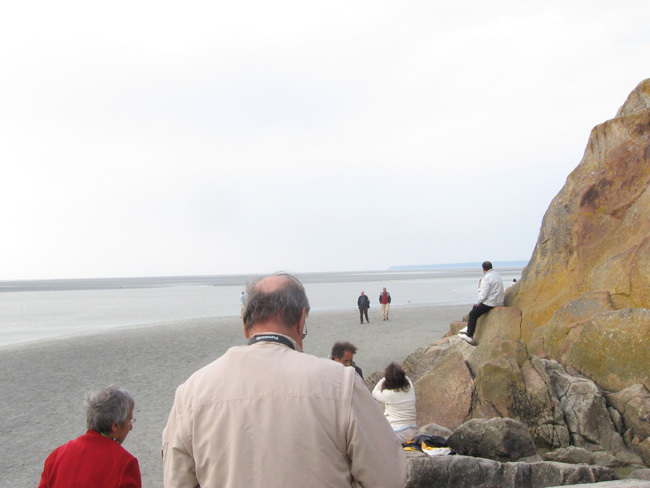 I made my way to the edge of the island, down near the mud flats, to watch the tide come in from a rocky platform where other tourists had gathered. It was late September, and the tide comes in around 5:30pm at that time of year. One moment all was calm on the mud flats, and the next moment I heard the sound of rushing water in the distance, and soon saw the waves quickly flow in. It was actually a bit intimidating! The water rushing in wasn't terribly violent, and it did become somewhat more gradual as it reached the raised stone surface I was standing on, but it was still a very impressive thing to see and hear. Once the tide is in, the entire island, other than the man-made land bridge, is completely surrounded by the gently lapping waves of the English Channel. Fifteen minutes after the previous photo, the tide has come rushing in. As I left Mont Saint-Michel a little while later, I turned around on the land bridge to take another look at the island now that the tide was completely in. The place was even more breathtaking with the setting sun glinting off of the waves and casting long shadows on the ornate facade of the abbey. It was fascinating to imagine that the spot where I was standing would've been under water a hundred or so years ago. For my visit to Mont Saint-Michel, I left Paris early in the morning and made it back into Paris by about 11pm the same night, which is do-able, but I think you'll have a more enjoyable experience if you stay the night in any of the hotels on or near the island (which are bound to be pricey, so beware). I love the idea of spending the night on the island and thinking about the visitors in past times who would've been stuck there until the tide went out again the next morning. Maybe next time. Mont Saint-Michel was one of the most enjoyable day trips out of Paris I've ever taken, and I'd absolutely recommend adding it to your list of must-see things in France.